In the decade following the Civil War, New York City was practically run by the Hawkes family. There was Samuel Arthur Hawkes, the Bishop, who sat on the platform of every important meeting and reworded every motion affecting the city's business for ten years. There was Judge Frederick Augustus Hawkes, who had been Mayor, who had founded the Daily Enlightener, who had been First Citizen since there was a cow pasture at 40th Street. And there was Olivia Speranza Hawkes-Billings--who could be more conspicuous in public works than she? Every morning she descended with some new idea, from milk inspection to, say, silk bookmarks for factory girls, diaries for prisoners and Oats Stations for the faithful horses that pull the tramcars. These three personages lived in the old Hawkes mansion on Sixteenth Street, where the host of callers and secretaries gave it the air of being a public building, Customs House or the Post Office. Each one retained a suite of offices. But there was only one drawing room and one dining room, and these constituted the inner shrine of the metropolis. Nature, in giving such a capacity to three Hawkes, stumbled over the fourth. For there was a brother named Cassius, who lived in a tiny room up in the eaves, played the flageolet and kept a scrapbook. In any other family Cassius would have been looked upon as an amiable, weak relative, a harmless ne'er-do-well; but against the background of Hawkes he appeared a half-wit. His cuffs were spotty and his lapels presented a free design in cold gravy. At table you had to get used to his hunting for his napkin among the company's shoes, and to his suddenly recollecting a Swiss trick with balancing forks. In the morning he would seize upon the newspapers, unfurl them in a passionate search for some item and leave them billowing over the drawing-room carpet. He loved cats and was forever smuggling them into that stateliest of drawing rooms, all enameled columns, velvet hangings and gilt mirrors. He was always present in the front of the house; he spent most of the day and night in the hall smiling blandly over his glasses and standing in the servant's way. If guests were ushered in he fell into conversation with them while they were waiting; read them clippings about whale blubber and the sponge industry and Siberia's output of pale rose quartz. If there were reporters he even told them the truth. His brothers should at least have been grateful that he did not drink; but they only shuddered at his munching of pecans. He was the man who boasted he could build a fire, waved back the servants and achieved a cold ashy heap of logs. He was the man who in repeating an important message, always forgot the exact hour or the place of appointment. You gave him letters to mail and he carried them about in his pocket for weeks. But how friendly he was! On the day when Queen Victoria's son called at the house (to thank Olivia Speranza Hawkes-Billings for erecting a statue to his father) even then Cassius rushed out from between two strong footmen, squeezed the fat hands of the Prince of Wales and welcomed him to the city. Even when Adelina Patti called to thank the Mayor for her wreath of golden laurel leaves, Cassius rushed down the stairs, lifted her out of the carriage and presented her with a copy of Longfellow's poems. Fortunately, we knew what Royalty and the Prima Donna thought of their impetuous host. A reporter overheard Bertie mutter to his gentleman: "These (blamed) Americans have sent out to me their (blamed) stableman." And the Diva says in her Journal that "only once in your Great Country was I treated with anything less than the respect which I only hope I deserved; on one occasion I think I may say that I was jostled." You may imagine what a cross Cassius was to his brothers and sister. They made a hundred efforts to send him away; they pretended his lungs needed the air of Albuquerque; they paid him to visit Formosa. But, like an unloved cat, he always turned up, talkative and grateful. They discovered that his room needed repapering and found him an apartment in the deserts of Brooklyn. And, of course, he always stayed for meals. With their fine old New England feeling for Family, the Hawkes could scarcely turn him out, or cut off his allowance, or even treat him rudely before company. It was one of those situations one had to endure. Suddenly, however, Cassius Hawkes disappeared, only to be found a day later floating in the Hudson, between the great piles of a transatlantic wharf, with some grass around his neck. Or was he found among the bushes dead and faintly redolent of chloroform? I forget. Perhaps it was he who was accidentally locked up in the aquarium overnight and discovered at dawn, poisoned by a sausage. Anyway, he died a vague, untraceable death and his funeral did not embarrass the traffic. His brother, the Bishop, read the texts over him one rainy afternoon, and reminded those present--a Judge and a handsome lady in black satin--that they had always the consolations of religion. Life at the Hawkes' mansion took on a great dignity in his absence; some people said, however, that there was nothing human left in the house, only a Bishop and a Judge and a famous Philanthropist, sitting down to long silent dinners and never, never meeting one another's eyes. It's strange to think that after Cassius' death, a newspaper friend published some odd manuscripts that had been found in his room. He had apparently been writing a book all those years, and that book is probably the most delightful book ever written by an American: The Chimneys of New Amsterdam. His statue stands in Van Zuyden Park and on the corner of the house on Sixteenth Street is a bronze tablet with this legend: In this house, from 1857 to 1871, lived Cassius Hawkes. This memorial has been placed here in loving gratitude by the school children of New York City, 1920. *Special thanks to Jacqueline Haun, Lawrenceville Archivist, for providing this long lost tale. 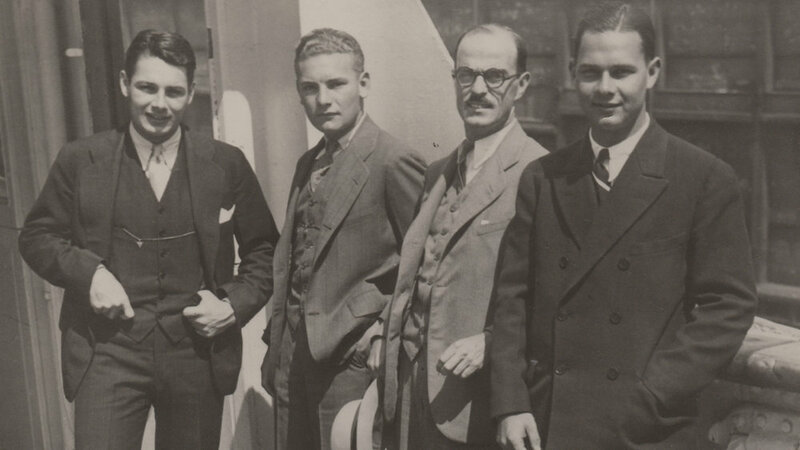 Photo: Chaperone Thornton Wilder aboard ship on a transatlantic voyage with three of his Lawrenceville School students (Clark Andrews, Henry Noe, and Duff McCullough), summer 1928.